Having a holiday party? No one wants to stand behind the bar mixing drinks all night, so this year you can set up a beautiful Vodka Decor Bar using Van Gogh Vodka flavors, like Dutch Chocolate, Pomegranate, Espresso, Mango, Dutch Caramel, and Black Cherry. It's simple to set up and everyone can mix their own drinks, while you get to mingle with all your guests. Set up 6-10 decadant, delicious flavors of Van Gogh Vodka in their decorative bottles. Add some mixers to the display like seltzer, juices, and sodas. Put out little dishes of garnishes like pomegranates, lemons, limes, and other fruit. Set up table signage on mini chalk boards or cards, with drink ideas and inspiration you can get from the Van Gogh Vodka recipe tab. Add a few touches of cheer with cookies and ornaments and your holiday party prep is done! Fill shaker with ice and add vodkas, chocolate liqueur, and a splash of cream. Shake and strain into a chilled martini glass. Garnish with a sprig of mint. Pour ingredients into a rocks glass over ice and stir. Garnish with an orange wedge. Pour chilled vodka into a flute. Top with sparkling wine and garnish with a strawberry. 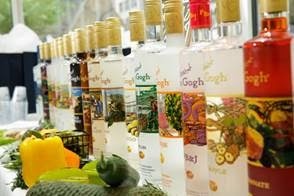 Get more great ideas and recipes to set up your Van Gogh Vodka Decor Bar! Mmm... Vodka is my choice of spirits and Van Gogh is one of my top choices. Did you try the espresso flavor?! It's heaven! Yes, I sure did! I love it too!